Champagne, Prosecco, but what about Cava? If price is an issue when you trying to buy some sparkling wine and you do not want to pay the price for a Champagne, other successful alternatives at a lesser price exist: Crémant de Loire, Crémant d’Alsace, Crémant de Bourgogne, Crémant de Bordeaux, Clairette de Die, Cerdon du Bugey, Mousseux, Blanquette de Limoux, Vouvray Pétillant (all from France and many more), Sekt (Germany & Austria), Prosecco (Italy), Lambrusco (Italy), Brachetto (Italy), American sparkling wines from California and New Mexico and Cava from Spain, and many more from all around the world (but the list will be too long). The aristocratic, posh or bourgeois ways and attitudes of most sparkling-wine-drinking-people will always tend to go toward Champagne and Prosecco, which is a bit of a snobbery because a lot of Champagne are very pricey and not necessarily that good (and people go often for recognizable brands that are making relatively generic Champagnes compared to some unknown and up-and-coming producers); and Prosecco(s), even if cheaper or better value than Champagne, can also be really boring and not that great, proof is Prosecco are often used for making Mimosa (sparkling wine + orange juice) with family and friends during Sunday brunch. But what about Spanish Cava(s), people do not really speak about them, which is a shame because they are as good value or even cheaper than Prosecco(s) and far less expensive than Champagne. Don’t get me wrong, I love Champagne and Prosecco! Marc Hebrart NV Rosé ($40-$45 from Michael Skurnik Wines) has been my go to Champagne for a little while now and compared to big brands producing millions of bottles of Champagne that in my opinion have a certain lack of character (no point to give names, they are the most well-known and advertised in this price range), I think that it is a much better Champagne from a smaller producer who is in control of his own small production and carefully pay attention to the quality every step of the way, from vineyards to vinification, etc.. It is a subtle, delicate, feminine, and racy delightful Champagne Rosé. Lattitude 50 Sekt Rosé is a German sparkling wine that is also a great value ($19-$21, from Savio Soares) which much more fun than a lot of Champagne and will definitely do the trick in any occasion. Light on its feet, fun, friendly, festive, refreshing with a pale salmon color with orange reflects, it is a party pleaser. Bisson Prosecco is also a great value and a tremendous sparkling wine ($15-$18, from Rosenthal/Madrose). Classic in style with its regular cork rather than the pop-up champagne cork and muselet, it is a delightful, crisp, vivid, mineral and focus Prosecco of choice for connoisseurs and amateurs searching for balance and harmony and subtle mineral touch. However, let’s go back to Cava and one of my favorite, which has always been really good and consistent over last few years: Vega Barcelona. Vega Barcelona is a delightful, crisp, vivid and easy to drink Cava (a Spanish sparkling wine aged in underground limestone cave like in Champagne, hence the name “Cava” meaning cave) from the Penedès region, just outside northern Barcelona. Cava is made in exactly the same way as Champagne, but like many other sparkling wines around the world, it cannot be called Champagne because it is not coming from the French region of the same name, which by this way protect its wines from fraud and imitations. Cava has fully established its identity in the export markets in the last thirty years yet specialized bodegas - or Cava houses - have been producing on a commercial scale since the end of the 19th century. Today Cava is second only to Champagne in world sales of sparkling wine, followed by Prosecco and American sparkling wines. A blend of 3 different grapes, each grape variety for this Cava are harvested from each vineyard then fermented and vinified separately to allow for the differences in ripening dates and quality development. First fermentation takes place in stainless steel tanks at 61-62° for about 7 to 10 days. Second fermentation is in bottles, also called the “Méthode Champenoise” (i.e. 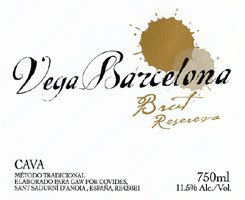 traditional) obtained for this Cava with selected yeast for maturation. The wine was left on its lees for about 9 months before disgorgement before bottling. A blend of 30% Macebeo, 35% Xarello, 35% Parellada from vines of over 10 years of age, Vega Barcelona Cava (NV) has a beautiful, bright pale yellow color with small to medium bubble. The nose combines aromas of ripe pear, white fruit, mineral and slate. The palate is clean, refreshing and friendly with citrus and white fruit flavors intermingled with hints of “crème brûlée” and more mineral enhanced by small zesty bubbles. The finish is soft, well-rounded, mineral, cleansing and inviting. It will surely contribute to the success of any occasion that requires some sparkles.